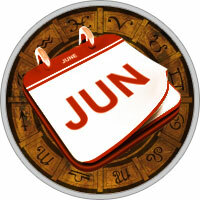 Health became more stressful on May 20 and remains so until June 21. As always, do your best to maintain high energy levels. Delegate tasks wherever possible. Rest when tired. Don't think that by pushing yourself you will get more done. Most likely you will only increase your work load because of mistakes. Enhance the health by giving more attention to the lungs and respiratory system until the 3rd and to the stomach afterwards. Women should give more attention to the breasts after the 3rd. Diet and emotional tranquillity become important after the 3rd. Health improves after the 21st though. Love is still the main headline until the 21st. Many a marriage or engagement is happening these days. This is serious, committed love. Those already married or in a relationship are having more romance within that relationship and attending more parties and gatherings. The social scene cools down a bit after the 21st - probably your love and social goals have been attained. The Sun leaves your 7th house on the 21st and Jupiter, the Lord of your Horoscope, leaves that house on the 27th, having spent a year there. This is a major move, a major shift. Pluto, the planet of personal transformation, was in your sign for many years until 2008. So you have been involved in personal transformation, personal reinvention for many years. You had a brief hiatus for the past four years but now you are again involved in this. You are giving birth to a new you - an ideal you. This can be hard work at times. One must be willing to die to the old ways and old thought and emotional patterns. Often the process brings crises but you are enjoying all of this; though painful, the birth of a child is considered a good event. So it is with you. Finances are OK until the 21st. There are no disasters, but nothing special either. But after that date, earnings soar. Keep in mind though that your financial planet is still retro­grade. There can be delays and misunderstandings, but this won't stop the prosperity. You still need to work on your mental clarity here. Financial opportunities (and there will be many) need a lot more homework. Your spouse, partner or current love enters a yearly financial peak on the 21st. In fact, the whole year ahead is a prosperity period. He or she will be more generous with you. You are in a good period for paying down debt. If you need to borrow, get a mortgage or other kind of business loan, it is very good for that too. An inheritance is likely for many of you - if not this month, then in the coming year. Moves could also happen now. The family circle expands either through birth, marriage or through meeting people who are like family to you. Sagittarians of appropriate age are unusually fertile after the 21st.